It would be an understatement to say I’m having a rough time of it right now. There’s really no getting around it. They’re the equivalent trust fund babies, more or less, the kind of kids whose parents pay their rent, pay for their groceries, give them allowances, etc. They don’t have to get jobs, they don’t have to budget, and right now, they’re basically living a bit of a Real Housewives of New York City lifestyle. Going out to eat, going out to drink, doing pretty much nothing with their days except going to the gym and taking classes. I really do love them. We get along so well, they’re funny and kind and compassionate and really don’t act entitled in the slightest. Soul-mates may be the word. It’s just gotten SO hard to come home from a 9+ hour work day (I work two part time jobs) and see them sitting at our kitchen table, drinking their wine and being pretty relaxed, all in all. We’re all doing our best to make it as artists. It’s hard for all of us. They’re just more fortunate in the fact that they have the assets to focus on it 100% of the time. And I’d be lying if I said I wasn’t jealous. Tonight, I asked my Tarot to give me some guidance. I need to get out of this resentment and anger, because honestly, it’s not helping the situation. There’s nothing they can do about who they are, there’s nothing I can do about who I am. We have different circumstances, that’s all it comes down to. I went through my deck, trying to find the card that spoke the most to my situation and up came The Eight of Cups. This was an emotional card for me to draw, especially the Tarot of the Sweet Twilight version, which features two people (a man and a woman, just like my two roommates) sadly looking away from each other. 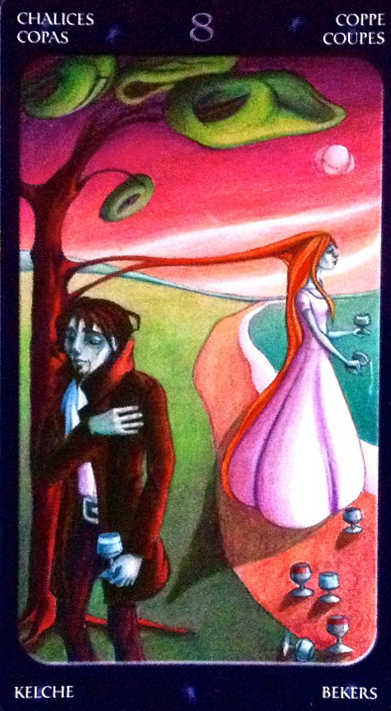 The Eight of Cups is about leaving something behind. Turning away from a bad influence and letting it go in order to heal. And sometimes, that really isn’t easy. There can be so many good things about whatever you have to let go of, but at the end of the day, you’re only making yourself miserable by grasping on. I need to let go of this resentment, or else risk losing my friends. I want to reconnect with all the good things in my life, not just the stuff that’s hard or unfair. I can’t walk away from my friends, so I’ve got to walk away from my anger, and find a positive spin on my lifestyle in comparison to theirs. I hate letting go. 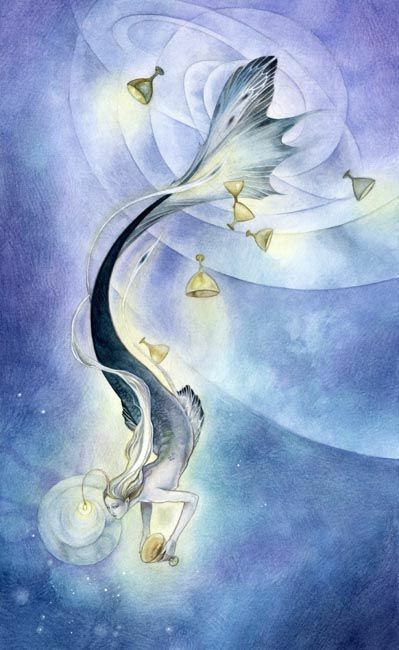 I hate the Eight of Cups, in a way. I don’t do well with releasing or saying goodbye, and there’s honestly so much tension inside me I’m surprised I can even communicate spiritually at all. The Eight of Cups is a card I absolutely dread coming up simply because I just grip and grip and grip at everything in my life. I have to release if I want to be happy. I just need a little more time to figure out how. 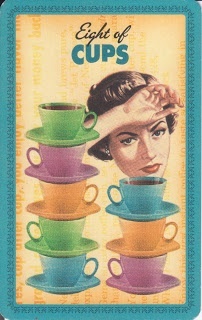 Check out my Eight of Cups Pinterest Gallery Here.